We’re delighted to introduce the latest series in the range of language learning materials from the Radio Lingua Network. A Flavour of German will help you to ‘spice up your German’ by teaching you idiomatic German phrases and helping to increase your range of expression. In the show the tables are turned on Coffee Break Spanish teacher Mark, who is aiming to improve his German, ably assisted by teacher Julia from One Minute German. 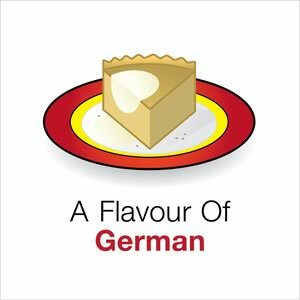 Join Julia and Mark in fortnightly episodes and spice up your German with Radio Lingua. Subscribe in iTunes now! how do i get the pdfs? The pdfs and enhanced podcasts will be available within the next couple of weeks and we’ll post an announcement here. Could I please request a podcast topic? If so, a podcast about health would be a great help to me. These podcasts were great! I loved them and sincerely hope for a new season. I just discovered these recently & am sad to see that there is only one season so far. I hope you start back up soon! It will help me in my German class!! I appreciated these podcasts. Thanks and I hope for more. I appreciate them too, nice small chunks and easy to follow. Hope there’s more to follow! Please do a new season! They were fascinating and very helpful podcasts. I’ve learned more from these podcasts then I did taking german in college. 🙂 So please do another season. I hope there will be some more podcasts like this soon, as well!